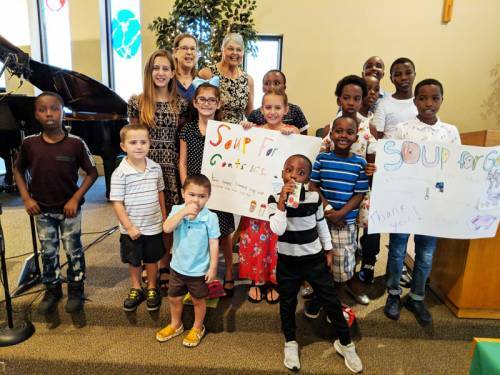 A Sunday school class composed of elementary and middle school students has generated mission interest through a soup-making venture aimed at helping Presbyterian Mission. They assembled the ingredients, put them in jars they had labeled, and sold the mixture to the congregation. The children used the proceeds to give a pair of goats, a family of chickens, a piglet and six refugee food baskets through the Presbyterian Giving Catalog. Half of the class are refugees from the Democratic Republic of Congo, and their leaders suspect that goats were popular because the animals had been part of the refugee children’s experience. They and their families lived in refugee camps in Rwanda and other African countries before coming to the U.S. The ages of class members range from 5 to 14, and finding activities that appeal to all members can be challenging, says Rebecca Gray, the Christian education elder at Heritage Presbyterian. She noted that Soup for Goats proved to be an ideal project to bridge the age gap. “We modeled it after a Junior Achievement project to engage the older children and to make them leaders,” Gray said. The children volunteered for specific roles such as chief financial officer, chef or advertising specialist. Weeks before the soup went on sale, the children began promoting Soup for Goats during Sunday worship. They had a regular worship leadership role. They talked about their Sunday school lesson and often engaged the congregation through a song, a game or a skit. They used this opportunity to promote Soup for Goats. Worship involvement at Heritage Presbyterian seeks to cross both generational and cultural lines. Every week, the peace is passed in Kinyarwanda, the language spoken by most of the refugees. Thanks to a Presbyterian Mission Agency grant, the church was able to hire an interpreter who translates every aspect of worship for Congolese adults who listen through headsets. Most children, Muenich said, do not require interpretation. The connection between Heritage Presbyterian and the Congolese refugee community began through a friendship Muenich has with an African pastor who received political asylum in the U.S. several years ago. The pastor, who is from a non-Presbyterian background, introduced her to a Presbyterian family from Congo who wanted to attend a Presbyterian church. Muenich and an elder visited with the family and brought them a food basket. Despite cultural and language barriers, the family accepted their invitation to attend the church and became part of the congregation. About a year later, some friends of the family arrived from Rwanda, and the family invited them to Heritage Presbyterian. “It started building through that,” Muenich said. Pat Cole is a communications specialist with the Presbyterian Mission Agency.